One of the most basic, yet often misunderstood, components of a control system is the simple HOA (Hand-Off-Auto) switch. Undoubtedly there are many installations in which multiple control switches are needed in different areas of the plant in order to control a single field device. 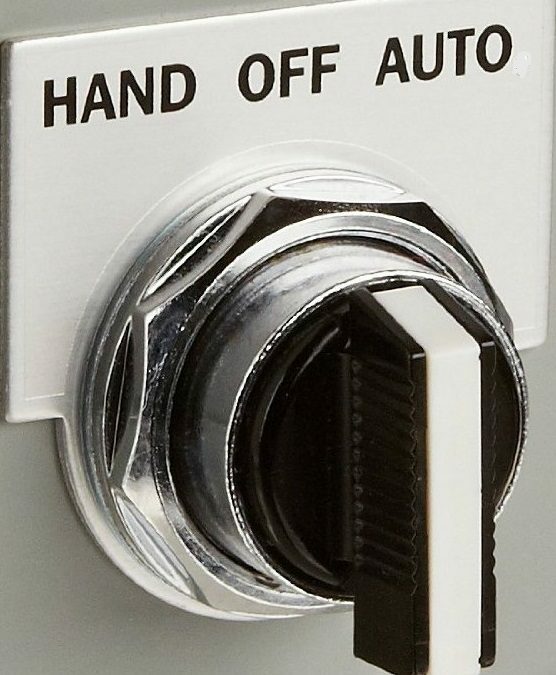 This is a recipe for confusion: if one switch is in the “Hand” position and the other is in the “Auto” position, how is the device going to be controlled? Additionally, when a PLC or SCADA system is involved, the opportunity for confusion increases further: does “Auto” mean controlled by the SCADA system? 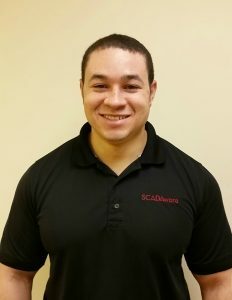 And if so, what term should be used if the SCADA system allows plant personnel to manually set a fixed PLC output to control the field device rather than allowing the PLC itself to automatically set the output? As we’ll see, perhaps the confusion is in the use of the term “HOA” itself. One of the best ways to determine how to designate a control switch operation is to use the terms “Location of Control” and “Mode of Control.” Location of Control is a phrase that refers to the place from which the motor or other field device is being operated. Locations could include “Hand” (it is operated directly at the starter), “Local” (it is operated by Start/Stop contacts near the motor), or “Remote” (it is operated by a PLC or other device that is distant from the process itself) and “Off” (no location allowed). On the other hand, Mode of Control, refers to the control strategy used to operate the device. Modes could include “Auto” (it is being controlled based on a set of process conditions) or “Manual” (it is being controlled by fixed operator input) or “Off” (device is still energized but control is presently disabled). Thus, an inherent problem with the term “HOA” is that it combines Location of Control (“Hand” designation) with Mode of Control (“Auto” designation) on the same switch. In older Distributed Control Systems (DCS), this may not have been much of a problem. In many older systems, there was only a single switch for the device, there weren’t multiple ways to control it, and the term “Hand” could serve the dual function meaning both Location of Control and Mode of Control. But in larger and more modern systems in which there are multiple places and means of operating a device, the term HOA is often insufficient. Thus, by distinguishing between these two aspects (Location of Control and Mode of Control), we can determine how to implement a control switch (or switches) that can accommodate a wider range of modern control systems. If a control switch is being used to select between controlling directly at a device versus control by a remote PLC or SCADA system, an “LOR” switch (Local-Off-Remote) or “HOR” switch (Hand-Off-Remote) would probably be ideal. But if the control switch toggles between an operator-adjustable output and a variable output based on a process condition, an “MOA” switch (Manual-Off-Auto) would be the better fit. Regardless of what is decided, the most important thing to avoid is having multiple switches with redundant labeling (i.e. multiple “HOR” switches) or mixing Location and Mode terminology on the same switch (i.e. a “Manual-Off-Remote” or “Local-Off-Auto” switch). Unless a very specific application demands redundant switches or mixed-terminology switches, it is better to avoid them altogether. A motor has two control switches that control its operation: the first is located in the Motor Control Center (MCC) and the second is located on a control station directly near the motor. Both are labeled “HOA.” What happens if the motor is in “Hand” at the MCC but in “Auto” at the motor? Or in “Auto” at the MCC but in “Off” at the motor? How are these switches wired to control the motor? Perhaps more importantly, how are plant personnel going to correctly remember and understand the various switch combinations? Multiple uses of the “HOA” designation for the same device is a recipe for confusion – both switches are labeled with the same function which makes it unclear exactly how the motor is going to be started. Instead, properly understanding Location of Control and Mode of Control can solve the issue. Typically, the control switch at the MCC determines where the motor will be control – thus, this switch would be the Location of Control. It could be labeled as “Local-Off-Remote,” with Local referring to operating the motor right there in the MCC via Start/Stop pushbuttons and Remote referring to operating the motor elsewhere (i.e. out at the motor control station). 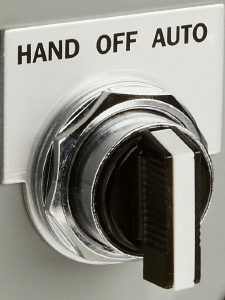 The second switch, out at the control station itself, could then be labeled as “Hand-Off-Auto” which would designate the Mode of Control. In “Hand” the motor would run continuously and in “Auto” the motor would start and stop by a PLC or other controller. A modulating valve has a control switch labeled “Hand-Off-Auto” located near the valve. In “Hand,” the valve can be jogged open or close right at the switch. In “Auto,” the valve position is set by a PLC analog output remotely. However, when the valve control switch is put into “Auto” mode, plant personnel then have two options to control it: they can use their SCADA interface to manually set a fixed valve open percentage in a register located in the PLC, or they can allow the PLC to modulate the valve position based on the plant process. Thus, when the valve control switch is in “Auto,” that doesn’t truly mean that the valve will operate automatically – it could be that the plan personnel has decided to manually enter a fixed valve position through SCADA. Instead, a proper understanding of Location of Control will lead to better design of the control switch. Rather than labeling the switch “Hand-Off-Auto,” the switch should be labeled either “Hand-Off-Remote” or “Local-Off-Remote.” The Remote designation would indicate to plant staff that the valve is being controlled by a remote device – in this case, a PLC. Then, in SCADA, the Mode of Control for the valve would either be “Manual” (fixed valve percentage set by plant personnel) or “Auto” (real-time modulation by the PLC based on process conditions). Regardless of your particular installation, recognizing the difference between Location of Control and Mode of Control can alleviate much of the confusion that arises when either multiple control switches are needed or a SCADA interface adds another layer of control situations. Keeping the terms separate and identifying the true function of the control switch will not only streamline design for the engineer, but also help avoid unnecessary headaches for plant personnel as they operate the system. Please contact us today if you have feedback, questions, or need assistance!